A 28 page Report detailing our first 200 days of financial independence. The Report is in PDF format, and is available via download. We encourage you to build the future of your dreams as if your life depended on it, because it does. So whatï¿½s the plan, Stan? 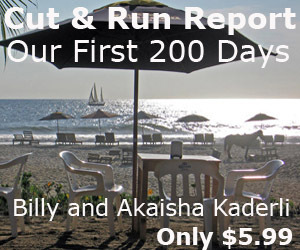 Billy and Akaisha Kaderli are recognized retirement experts and internationally published authors on topics of finance, medical tourism and world travel. With the wealth of information they share on their award winning website RetireEarlyLifestyle.com, they have been helping people achieve their own retirement dreams since 1991. They wrote the popular books, The Adventurerï¿½s Guide to Early Retirement and Your Retirement Dream IS Possible available on their website bookstore or on Amazon.com. Retire Early Lifestyle appeals to a different kind of person ï¿½ the person who prizes their independence, values their time, and who doesnï¿½t want to mindlessly follow the crowd.